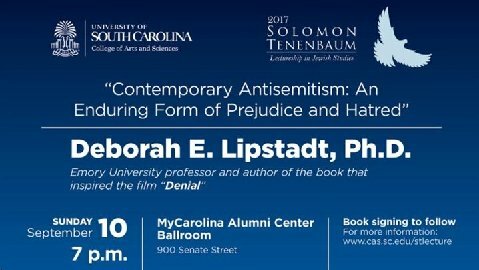 Opportunity to Hear Deborah Ester Lipstadt! 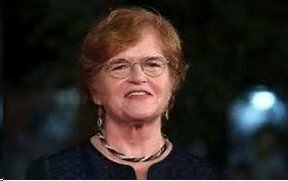 A brief bio on Deborah E. Lipstadt, Ph.D.
Deborah Esther Lipstadt (born March 18, 1947) is an American historian, best known as the author of the books Denying the Holocaust (1993), History on Trial: My Day in Court with a Holocaust Denier (2005) and The Eichmann Trial (2011). She is currently the Dorot Professor of Modern Jewish History and Holocaust Studies at Emory University in Georgia, United States. On September 5, 1996, Holocaust denier David Irving sued Lipstadt and her publisher Penguin Books for libel in an English court for characterizing some of his writings and public statements as Holocaust denial in her book Denying the Holocaust. Lipstadt’s legal defense team was led by Anthony Julius of Mishcon de Reya while Penguin’s was led by Kevin Bays and Mark Bateman of Davenport Lyons. Both defendants instructed Richard Rampton QC while Penguin also instructed Heather Rogers as junior counsel. The expert witnesses for the defense included Cambridge historian Richard J. Evans, Christopher Browning, Robert Jan van Pelt, and Peter Longerich. Although English libel law places the burden of proof on the defendant rather than the plaintiff, Lipstadt and Penguin won the case using the justification defense, namely by demonstrating in court that Lipstadt’s accusations against Irving were substantially true and therefore not libelous. The case was argued as a bench trial before Mr. Justice Gray, who produced a written judgment 334 pages long detailing Irving’s systematic distortion of the historical record of World War II. The Times (April 14, 2000, p. 23) said of Lipstadt’s victory, “History has had its day in court and scored a crushing victory. Would anyone like to go with Rabbi Liebowitz to hear this lecture on Sunday, September 10? We will leave the temple around 4:00. « Mazel Tov to Jason McKinney! » Yizkor Book Reminder!